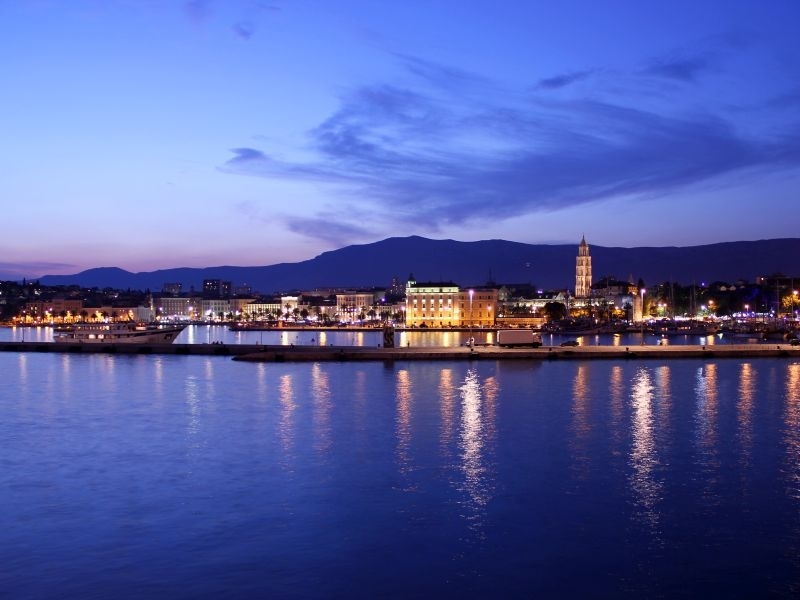 Split is the largest city in Dalmatia and the second largest city in Croatia. Split is the second largest Croatian port and the third port in the Mediterranean by the number of passengers. The city center is made up of the ancient Diocletian's palace from the 4th century which has been under UNESCO protection since 1979, which is a unique example in the world. Split is located on the Adriatic coast in central Dalmatia on the peninsula of Split (Marjan). From the height, they surround it in the hinterland - north and northeast of the Mosor mountain, northwest Kozjak hill, east of Perun hill, and the old city core is at the foot of Marjan hill. Split peninsula is surrounded by the islands of Brac, Hvar, Šolta and Čiovo. 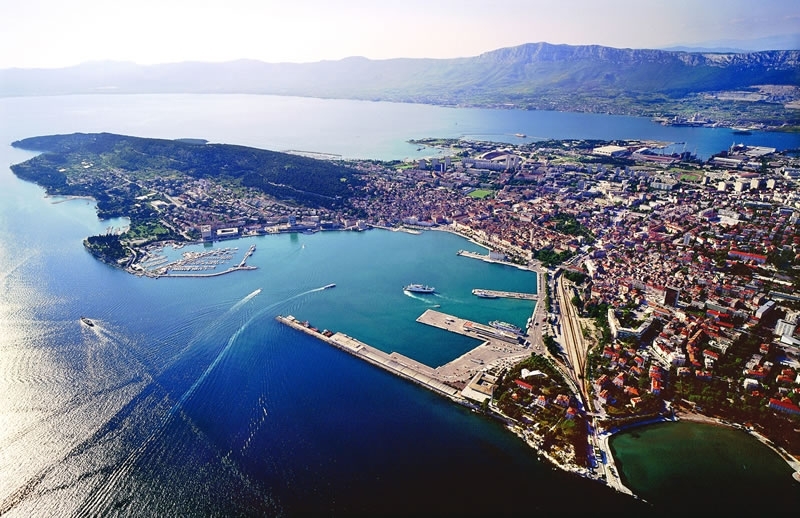 Split is a maritime and road hub, and from ancient times to the present day it is unavoidable to reach the intersection of the roads between Central and Southern Europe. Split is a city of numerous events, such as the Drama and Music Splitska Summer and Diocletian's Evenings, accompanied by concert performances by world renowned musicians, and the city's life is transmitted to its streets by lending the spirit of continuous events and content that complement day and night life. The city is where you can enjoy top gastronomy and wine, find numerous cultural events such as movie and theater festivals, exhibitions, top museums and concerts, a city that offers entertainment from numerous clubs and bars across street events to the music festivals that visit each year And up to 100,000 young people from about one hundred countries of the world. Hill Marjan is a symbol of the city that, with its forest, running trails, hiking and cycling, recreational terrains and ancient churches, completes the offer you can enjoy. There are also beaches, for the city of Split, an unusually numerous and clean sea, from the famous sandy beach Bačvice to the rocky secluded oasis around Marjana, and the beach on the Žnjan platou with many amenities. Sport is a special feature of Split. Trophic split clubs like K.K. Split (declared by the FIBE Best Club in the 20th Century), the Hajduk Football Club (multiple champions of the former Yugoslavia and the national champion's winner and a frequent participant of UEFA club competitions), the water polo clubs Jadran, Mornar and POŠK (the Champions League winner and the Cup of Europe Cup) And individuals such as tennis player Goran Ivanišević (winner of Wimbledon 2001) and athletics coach Blanka Vlasic, raise this city to the pedestrian of the Croatian sports center. In the city and its surroundings there are all the facilities for the lovers of history and nature, as well as for those who love the active holiday of desiring adrenaline events. The panoramic Split can be seen closer from the first Marjan sightseeing or from the 11 km distant cliff fortress from which you can see the whole of Split and Split's aquatic islands. Diocletian's Palace is an ancient palace of Emperor Diocletian. About 300 years, the Roman Emperor Diocletian raised her and retired after her retirement from the throne (305) to the death (316). According to its composition, Diocletian's palace carries elements of the Emperor's villa, the Hellenistic town and the fortified military camp. Since the palace was 6km away from the nearest large town of Salona, ​​it was surrounded by ramparts. There were four entrances to the palace. Three on the land and one on the sea side. The entire palace space was divided into two parts. In the northern part, there were offices, army, warehouses and other buildings, and in the southern, more gorgeous part, which was erected on the north by the overgrown substructures (so called basement of the palace), there were objects destined for the imperial family. Today it is also important to mention the international airport Split, the second largest in Croatia and Croatia, as well as the Split ferry port from which it ferries to all the islands of Central Dalmatia and numerous other destinations on the Adriatic.